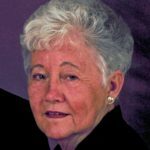 Garnet Maurine Bradley | Gerth Funeral Service, Inc.
G. Maurine Bradley, 85, of Bible Grove, Missouri, passed away peacefully on Friday, October 12 at her home. Maurine, or Sissy as she was affectionately called by her siblings, was born December 28, 1932 in Kirksville, Missouri to Morrise Glen Newcomb and Mary Ruth Long Newcomb. She lived her entire life in northeast Missouri in Scotland, Schuyler, and Adair counties, graduating from Downing High School in 1951. She started her nursing career as a nurses aid at Kirksville Osteopathic Hospital. On February 14, 1953 she married Okie Deen Bradley and spent the rest of her life on the family farm north of Bible Grove where she helped Okie Deen farm and raise five children. In 1971, while four of her five children were in high school, she enrolled in the Kirksville Public School of Practical Nursing to become a licensed practical nurse. She resumed her nursing career at Laughlin Hospital and after a few years continued her career as a nursing supervisor at the Kirksville Regional Center for Developmentally Disabled Children. She later worked at Chariton Valley Center, also with developmentally disabled children. Maurine was well liked by her associates, earning their respect and admiration for her devotion to developmentally disabled children. She was especially fond of her little buddy Kenny, and often brought children home to the farm for weekend retreats. Maurine also enjoyed bird watching and had a special fascination with owls. Surviving are her children, Mike Bradley of Olathe, Kansas; Pat Bradley of Bible Grove; Steve (Cindy) Bradley of Lindale, Texas; Joy (Joe) Moore of Camp Point, Illinois; and Bruce Bradley of Warrensburg, Missouri. Maurine delighted in her grandchildren, Jeremy (Laura) Bradley of The Colony, Texas; Jeremiah Bradley of Garland, Texas; Heather (Mark) Titterness of Sequim, Washington; Julie Cottini of Olathe, Kansas; Anna (TC) Calvert of North Little Rock, Arkansas; and Josiah Moore of Denver, Colorado; and great grandchildren, Conner, Lauren, and Grace Titterness; Holly Sullivan, Violet Cottini, Rylee and Kendall Bradley, and Jensen Calvert. Maurine was baptized into Christ and fellowshipped with the body of Christ at Bible Grove. She was preceded in death by her husband on July 27, 2005. She was also preceded in death by four brothers Harold Newcomb, William Newcomb, Robert Newcomb, Morrise Newcomb, Jr; three sisters-in-law Marilyn Newcomb, Mardell Newcomb, and Carol Newcomb, and one daughter-in-law, Cindi Bradley. Surviving siblings include Charles (Shirley) Newcomb of Greentop; Maxine (Emmett) Phillips of Memphis; and Don Newcomb of Memphis; and sister-in-law Betty Newcomb of Indianola, Iowa. To my sweet friend and roomie, we are thinking of you during this time. May the love of our Heavenly Father comfort you and give you peace. She is singing with the angels in a perfect new body, hanging out with your dad and others she’s been missing. God bless you all. Sorry to read of Maureen’s passing. We have fond memories of our visits to Bible Grove church of Christ. We even saw Maureen one year at the same motel at Searcy when we visited our niece at Harding University. We know Joy and family more so through Bible camp. Sorry for your loss, but confident of her reward. Love in Christ, Barry and Cathy Poyner, Kirksville Church of Christ. We plan to give a memorial gift in her memory to the church in Kirksville.